One of the things I really miss about Poland are zapiekanki. 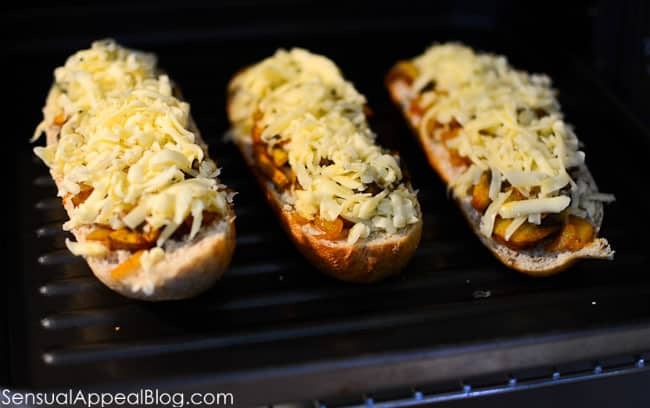 Zapiekanka is a Polish street food that is super easy to make and is very popular in Poland. Wikipedia says: Zapiekanka is a is a Polish halved baguette or bread topped mainly with mushrooms and cheese, alsoham or other types of meat, and vegetables. Beside some basic versions there are several recipes like: “zapiekanka na ostro” (spicy Zapiekanka) and “zapiekanka z mięsem” (Zapiekanka with meat). They are usually placed in an oven until the cheese melts and the baguette or bread is crispy. It is served scalloped and usually topped with dressings like ketchup and chives. It’s a very popular fast food in Poland. Sidewalk sale prices range between 3 and 7 zł for an approx. 25–50 cm long Zapiekanka. Last week zapiekanka jumped into my head and I started craving it! It was totally random, no idea where the craving came from but I knew I wanted that melty cheesy delicious goodness with a crispy bread. I had to remind myself what actually went in a zapiekanka and I was happy to see that it was not much. After a quick trip to a grocery store, I had everything I needed to make the craving a reality! My dad was super excited. While I’ve lived in the US for 10 years, he hasn’t been back to Poland for 16 years or so. That’s also the last time he had a Zapiekanka. I meant to make one for my mom too but she was at work at the time the craving really set in. Sorry Mom! While the traditional street food Zapiekanka is very long, made on a long baguette bread, I didn’t want to get the ultra long baguette from the store. I didn’t want to get the plain white bread one either and I saw the smaller versions of the same baguette but a whole grain version. I have to say, I love freshly baked white bread with a crispy exterior and a soft interior but I doubt you’d be able to tell the difference in the two kinds of bread for this since both would be toasted and covered with tons of toppings, so might as well go for the healthier alternative. The recipe is for two halves of a baguette but I made three halves because that’s what we had. Don’t pay too much attention to the amounts in here too, this really is all up to your own tastes and preferences. 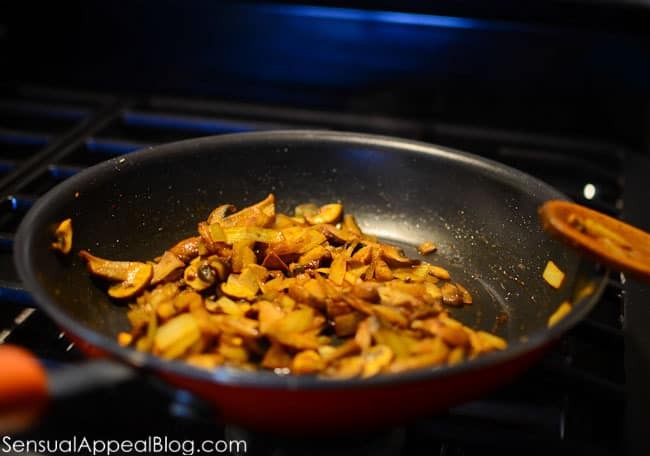 You might like less mushrooms and more onions, or maybe you’ll like more. It’s all up to you! I have the photos for you of the process so you can see how much I put on mine for reference. Lastly, if you don’t like ketchup, you fail. Just kidding. But seriously, the traditional way to eat a Zapiekanka is with ketchup so I totally recommend you try it the traditional way. It is SO SO SO good! Ugh. I want one again now. Blogging tends to do that to me. Nomz. If you like this dish, you will love the other recipes in the Polish Classic Recipes Cookbook. Check it out and let me know what you think! Have you ever made this dish? How did it turn out? Did your friends like it? This looks AMAZING! definitely gonna be making this tonight! You make me really happy, it was delicious. Everything about this sounds heavenly! 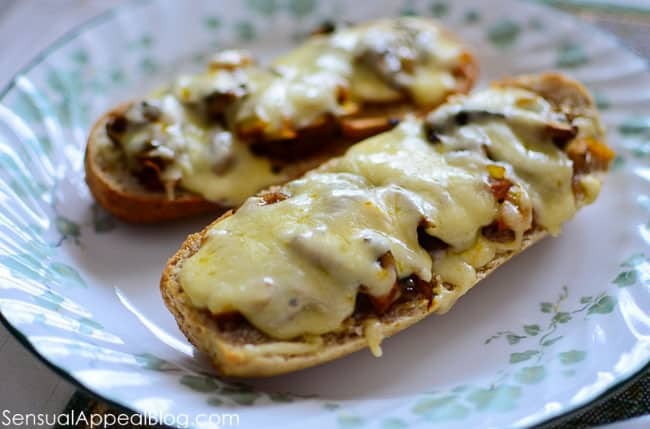 Love mushrooms, love baguettes, love cheese…sign me up. Woohoo, yes! Let me know how you like it when you make it! 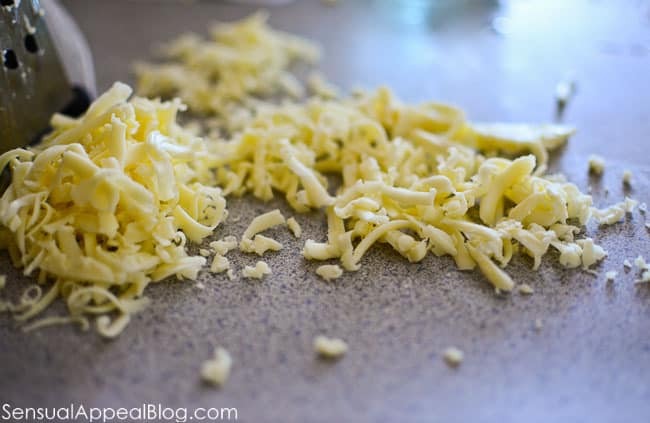 I am in love with cheese, and so this makes my taste buds so happy to see. I don’t usually go for ketchup, but if you say so, I’ll spring for it! This is Polish street food? It looks so good, it made my mouth water. Haha thanks hun! I actually never had a cheesesteak before, is that crazy? Oh yeah, I can totally see me loving one of these! I mean c’mon, it’s warm, it’s toasty, and it’s CHEEEEEEEEEEEESY! 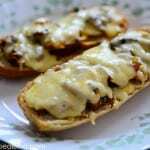 There is nothing like the contrast of soft stringy melty cheese over a crisp, crunchy toasted baguette! And since you saw me dipping mushrooms in ketchup just a couple of weeks ago, you KNOW there would be no doubt in with to top it with! 😉 Looks great girlie! I first tried this at the Epcot food and wine festival and had to have it again when I got home. Thanks so much for the recipe! It was delicious. Such a quick and easy lunch. I am hooked.